Are you ready to replace your current vehicle with a new—or newer—set of wheels? If so, you've got lots of company. The average age of passenger vehicles on the road is approaching 11 years, and automotive sales have been growing. Avoiding these traps is well worth the time in dollars saved. Many of these consumers, however, spent as much as several thousand dollars more than they needed to. Why? They fell into one or more of five common traps in the car buying process that I'm going to show you how to avoid. Doing the homework necessary to avoid these traps will take you a little time. But how hard and long do you work to earn $500? $1000? Even more? Avoiding these traps is well worth the time in dollars saved. A monthly payment they think they can afford. A few vehicle models they like. But a monthly payment doesn't buy a car or truck; it buys a lump sum of cash. How much cash depends on how many months you finance and the interest rate of the loan. That amount of "loan cash" plus any other money you have, such as the wholesale value of your trade-in or any cash down payment, determines how much total money you have to spend on a car. Knowing the total amount of that "available cash" can help you pick vehicles, new or used, that fit your budget. Going into a car showroom or sales lot with only an idea of a monthly payment makes you a target for every soft and high pressure sales technique. You're likely to spend more than you had in mind and pay a much higher interest rate than you qualify for and pay it for a longer term. In fact, "your credit isn't the best, you know, but we can finance you" is a favorite sales ploy. Avoid this trap by shopping your financing first. Get a pre-approved auto loan from a credit union or a bank. If you have little credit or credit problems, you should try to be pre-approved at a credit union. Credit unions aren't perfect. But generally, they have lower auto rates that other financing sources. More importantly, they won't "work" you if you do have credit concerns. Many dealerships target customers with credit concerns for much bigger profits. With a pre-approved loan in hand you can shop for a vehicle that fits your budget and you can compare your pre-approved financing with other financing offers. That allows you to chose the deal that's best for you. Failing to shop your financing before you shop for a vehicle. Buying on your first visit to a dealership. Negotiating down from MSRP or "Asking Price," rather than up from what the vehicle cost the dealer. Thinking a sale means automatic savings. Ordering a vehicle without shopping the exact same vehicle. A primary dealership goal is for customers to drive off from their first visit with a new vehicle. Why? It prevents comparison shopping. Car sellers typically make much more money if consumers can't compare deals. Those comparisons include not just the price of the vehicle, but the value of your trade in and the cost of financing. As an example, sign-and-drive deals are popular today because they get you to buy on a first visit: just sign on this line and drive off in the vehicle you like. But what have you signed? Is it a lease or did you buy a car? Usually, it's a no down payment lease, but used vehicle sellers like it to sell vehicles. What are the terms of the lease or loan? What price are you paying for the vehicle? What is the total cost of the deal? Have you received the best terms you qualify for? Are you getting the true wholesale value of your trade-in? How can you know the answers to these questions? You can't—because you didn't take time to find out the terms and compare competing options. Avoid this trap by taking time to identify vehicles that fit your budget. Do some pre-shopping online to find out more about the vehicles and identify two nearby dealerships to shop at. Then go shopping to compare options and offers. We show you how in our Car Buying Guide. Trap 3: Negotiating Down from MSRP or "Asking Price," Rather than Up from What the Vehicle Cost the Dealer. Negotiating down from the sticker price of a new vehicle (usually Manufacturer's Suggested Retail Price plus the Dealer Sticker) or the "asking price" sticker of a used vehicle sets the bargaining in favor of the dealership. You will save more money if you set the bargaining in your favor. Do this by making a first offer based on what the new vehicle cost the dealership or on the "loan value" of the used vehicle. A number of free online resources can help you determine these figures. Our Car Buying Guide shows you how to use these resources. It also takes you step by step through the negotiation process. Tip: Each step in the vehicle buying process is a separate transaction.Remember to negotiate the cash price of the vehicle first. Then negotiate the value of your trade-in separately and subtract it from the cash price of the vehicle. Keep discussion of financing separate until after the first two steps. Smart salespeople like to mix all the separate transactions into one confusing mix the better to separate you from your dollars. For example, I have seen a dealership sell a new vehicle literally below their "cost" but make over $3000 on the customer's superb "cherry condition" trade-in because the guy had no idea of the true wholesale value of his old vehicle. Our Car Buying Guide describes typical confusing sales tactics and shows you how to keep the various buying transactions clear and separate. Forget the big banner and television ads, the tents and balloons. 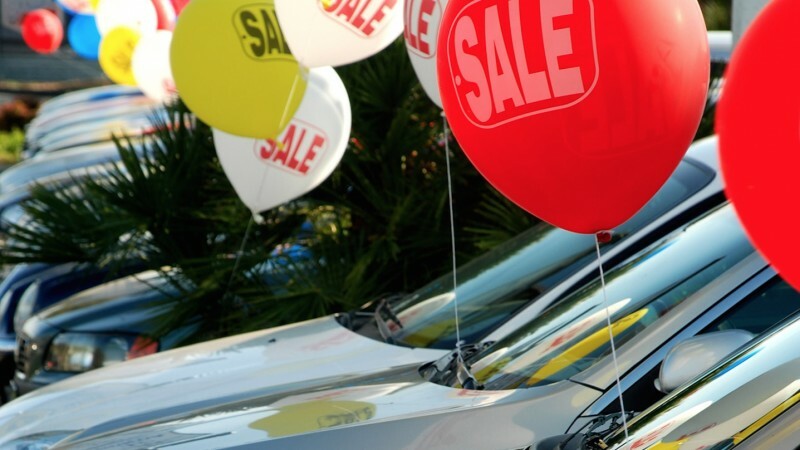 The word "sale" has a very different meaning to dealerships than consumers—it doesn't mean automatic or specific set savings for every customer. The goal of dealerships is always to maximize their profit on every vehicle they sell. Many dealerships' average profit per vehicle actually goes up during sales events. Remember that a vehicle "sale" does not mean "save money" and prepare for typical sales ploys. If you have done your homework as outlined in the Car Buying Guide then you can save money any time you visit a dealership whether during a "sales event" or not. So you're thinking, I'll avoid all this hassle by ordering the exact model I want with only the options I want. Ordering a car may be a good way for you to buy. But if you are going to order, get the price and make a list or print out of the vehicle's base cost and the options you've chosen and shop the price for that exact model with different sources. How Much Can You Save by Avoiding These Traps? How does hundreds to thousands sound? Each car buying process depends on multiple variables, but when buyers effectively use the process and techniques outlined in our Car Buying Guide they can save at each step of the buying transaction. Being a big saver starts now with clicking through to the Car Buying Guide.